soaked in broth") from a Germanic source, from which also comes the word "sop", a piece of bread used to soak up soup or a thick stew. The word restaurant (meaning "[something] restoring") was first used in France in the 16th century, to refer to a highly concentrated, inexpensive soup, sold by street vendors, that was advertised as an antidote to physical exhaustion. In 1765, a Parisian entrepreneur opened a shop specializing in such soups. This prompted the use of the modern word restaurant for the shops. In America, the first colonial cookbook was published by William Parks in Williamsburg, Virginia, in 1742, based on Eliza Smith's The Compleat Housewife; or Accomplished Gentlewoman's Companion and it included several recipes for soups and bisques. A 1772 cookbook, The Frugal Housewife, contained an entire chapter on the topic. English cooking dominated early colonial cooking; but as new immigrants arrived from other countries, other national soups gained popularity. In particular, German immigrants living in Pennsylvania were famous for their potato soups. In 1794, Jean Baptiste Gilbert Payplat dis Julien, a refugee from the French Revolution, opened an eating establishment in Boston called The Restorator, and became known as "The Prince of Soups". 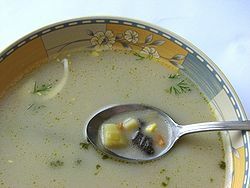 The first American cooking pamphlet dedicated to soup recipes was written in 1882 by Emma Ewing: Soups and Soup Making. Portable soup was devised in the 18th century by boiling seasoned meat until a thick, resinous syrup was left that could be dried and stored for months at a time. The Japanese miso is an example of a concentrated soup paste.